We partner with industrial and B2B companies by providing website design, content creation and a focused marketing strategy that delivers qualified sales leads with a positive ROI. We build a tailored strategy using our proven marketing program. Our objective is to implement a sustainable, ROI-focused plan that will deliver growth in web traffic, lead generation and your bottom line. Make an impression that grows leads. Know where your going and how to get there. Prospects are searching, be easy to find. Generate quality sales leads on demand. Reach your prospects with the right words. Turn cold leads into sales on autopilot. 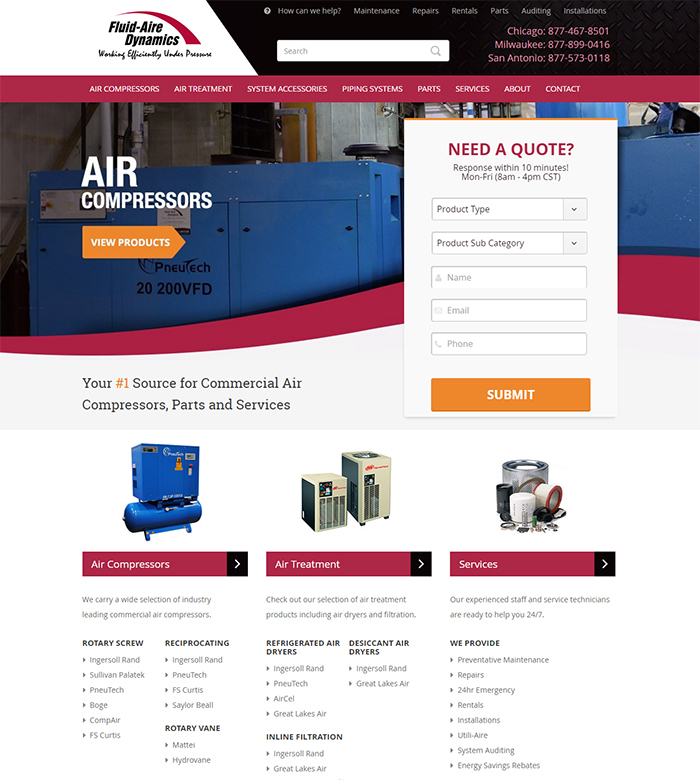 Starting back in 2014, we partnered with Fluid-Aire Dynamics with the objectives of expanding their web presence, improving their marketing initiatives and growing inbound sales leads. What began with a simple Adwords marketing campaign showing strong performance has since evolved into a more robust marketing strategy that includes search engine optimization, expanded paid search campaigns and a website redesign. We continue to review quarterly performance and remain focused on long-term growth. Website redesign that increased conversion rate and leads by over 90%. Decreased page load times to a whopping 2.2 seconds and responsive design to be more accessible to mobile devices. Improved search engine position and relevance to target market. Greater transparency and tracking of online sales leads. Take a look at Fluid-Aire Dynamics website and get in touch to discuss how we can partner together to grow your business.